Mykonos Bay Resort is Located on the Famus Costa Azul Surfing Beach, and Provides an Ideal Setting for Any Type of Vacation Getaway. It is Gated and Offers Complimentary Parking. The Condo Is a Corner Unit on the Fourth Floor. 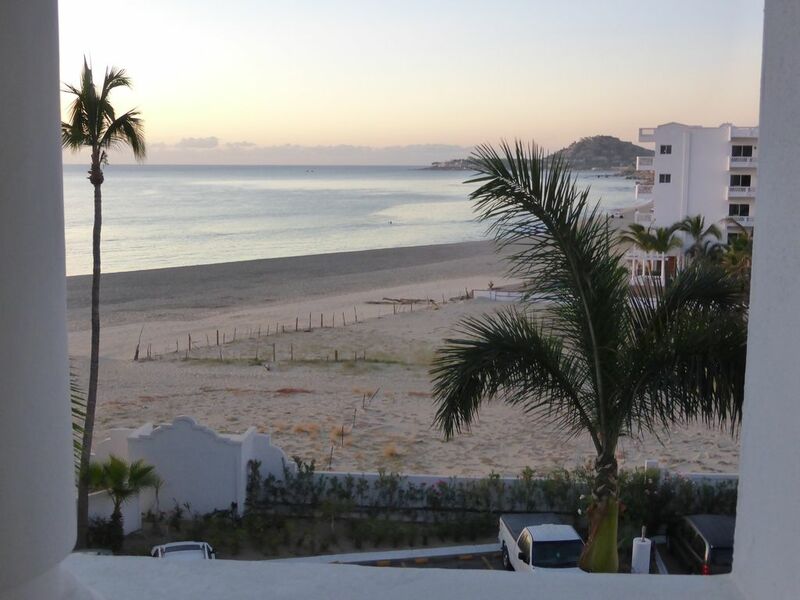 It Features a Beautiful View of the Sea of Cortez from Every Room. It Has a Sun Filled, Fully Equipped Kitchen. There is a Webber BBQ in one of the balconies for your quick and easy meal preperation. You Have the Use of Three Pools, and three Jacuzzis, Lighted Tennis Courts and a fully Equipped Gym . There Is BBQ Facilities by the Pools. Lot of Deck Chairs and Tables Around Pool Area. In addition, there is a Webber BBQ in the privacy of the balcony of yur condo. For the Surfers: 'Zippers' Surf Break Is Steps away, and 'Ole Mans', and 'The Rock', site of the 2001 Oxbow Longboard World Championship, Are Just a Short Distance Away. Fishing In the Waters Around Los Cabos is Fantastic, with Marlin, Dorado and Other Game Fish in great Abundance. Snorkeling at Chilleno Bay Provides an Up Close Experience with Many Tropical Fish and Leatherback Turtles. You Could be Whale Watching On the Beach in Front of the Condo. Some of the Locals' Favorite Restaurants and Shops Are Within Walking Distance. Downtown San Jose is Just Minutes Away, Where You Will Find Shopping, Fine Dinning, Arts and Crafts by Local Artisans. The Excitement and Night Life of Cabo San Lucas is Just 20 Minutes Away. AND everything Else Is Only a Short Walk or a short Drive Away From this Condo. It Also Offers the Most Relaxing Environment One Can Imagine. The Condo and Its Surrounding Areas Are Nothing Short of Spectacular. We also have a onsite manager in Mexico to ensure issue free vacation for our guests. Have the Best Vacation In Your Own Condo, Amigo!!! Dave and Ling Toews. We are from Edmonton, Alberta, Canada. This condo provides a much needed escape from the cold winters. We enjoy everything about San Jose del Cabo. It is a great second home for us. We purchased the property for its warm welcoming climate. It rarely rains. The location is second to none. Its clean air and pristine ocean water is the best we have encountered. The people are friendly. There is everything you will ever need to have a relaxing, interesting, and exciting vacation all at the same time. When we were there, it felt like we have just died and went to heaven! The condo is clean, secure, and is tastefully furnished. It is a corner unit, three sides with windows. Every room provides a view of the ocean, or hills covered with tropical vegetation. Grounds or the pools surrounded with palm trees and flowers or other vegetations. It has fiber optic internet connection and satellite TV with premium US and Canadian. Therefore, you could be as disconnected or connected to the rest of the world as you wish. Plenty of bath towels and extra sheets. Close to the Entrance of the Building. Gated and for owners and guest only. Bottle water and other drinks may be availble in the fridge. Spices and condiments are in stock. The kitchen is completely stocked with pots and pans, eating and drinking utensils, plates, bowls, cutlery, food storage containers both glass and plastic. (2) One from the patio door off the living room, and a separate one from the bedroom. 2 Patios, off Livingroom, off Bedroom. This condo is a corner unit of a building. Every room has a window. When you look out, you see spectabular views of the ocean and hills covered with palm trees, flowers and other attractive vegetations. The resort is well cared for and quiet (in terms of people). The security staff were friendly and helpful. The unit itself has beautiful views and is clean and comfortable but is beginning to show it’s age. You definitely notice the highway noise, but you would at most resorts along this span. The waves are loud too, so if you are sensitive to noise this may not be the resort for you. That was so diplomatic on the noise issue. To be at a vibrant resort, noise can be an issue. Being right on the beach, the waves can be pretty loud. We appreciate the opportunity of working with you on your trip. Thank you for your comments. They are all valid and helpful to the future visitors. You have a great spring and summer. Wonderful Resort, close to everything and the staff/security are very helpful. I got feedback from Peter that we were inconvenienced with the shower door repair. We did not have to do it at the time you were there. I am so sorry. It was always our philosophy that we should do all we could to make sure your stay is as good as it can be. There is no re-do on trips. You are such an accommodating person. We are so lucky to have had a chance to work with you. Thank you Kathryn. I am so sorry that you experienced an accident. It would bother anyone to witness. It would be a rare occurrence. We have been at Mykonos for over 10 years and we never had an accident in front. I hope that have not ruin your trip too much. It is a bummer to have the entrance not completed on schedule. It was supposed to be done October. There was no excuse to have taken so long. Mexico has such great weather; it is not as if they are in Alaska or Edmonton, where we have deep freezing temperatures. I am sorry that it had negatively affected your stay. The noise from the neighbor can be reduced significantly if the patio doors were closed. We had installed hurricane doors and windows. The glass in them are thick and noise reduction. I am suspecting that it was when you were outside of the condo that the noise was an issue. We are hoping the condo board is working to get the neighbor to turn down the volume when they are having group activities. Thank you for taking time out to give us feedback. We will try harder to do better in the future. Happy New Year! We loved our stay here! Easy walking distance into San Jose del Cabo to the markets and restaurants. We used the bus to get to activities in Cabo and the marina. The pool and beach were lovely and we didn't have to share with hundreds of others!! Thank you so much for sharing it with us and we hope to return soon! It was a pleasure working with you on your trip. Hope your parents and your family made wonderful memories. Thank you so very much for your positive feed back. We are looking forward to work with you again. The condo was clean and had welcoming gifts in the fridge and on the counter. Spectacular views from the kitchen and living room window of the beach and ocean . Kitchen is well equipped and has all a cook needs. Though it was high 80's all the time we were there, no air conditioning is needed as it has nice breezes during the day. The property is spectacular with several pools, hot tub, beach access and ocean just in front and a nice gym for working out. Tennis court is nice as well. Thanks Lin and your husband (forgot his name ) for letting us use your beautiful condo!! It is truly a bit of paradise!! What a pleasure having you visiting the condo!!! Guests like yourselves motives us to continue to improve the condo to make it even more attractive and enjoyable to stay. Great condo. We had a wonderful time. Thanks you Ling and David for renting us your condo! What a fantastic place with everything we need! Everything was great! Kevin, it was a pleasure working with you!!! Thank you so much for all your positive feed. Cancellation: 100% credit for re-booking on dates available, if done at least 60 days before arrival date.